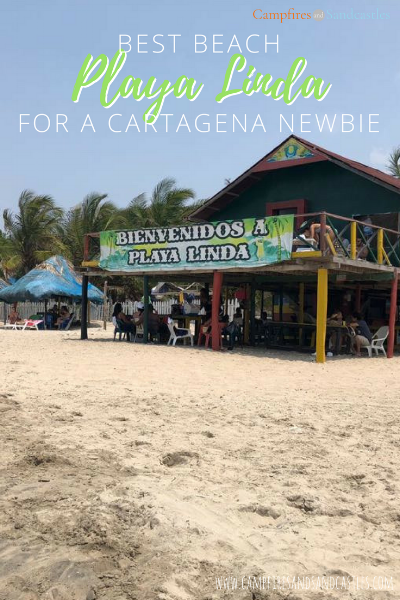 Located on the western shore of Isla Tierra Bomba (the island across the bay from Cartagena, Colombia), Playa Linda is best known by locals. 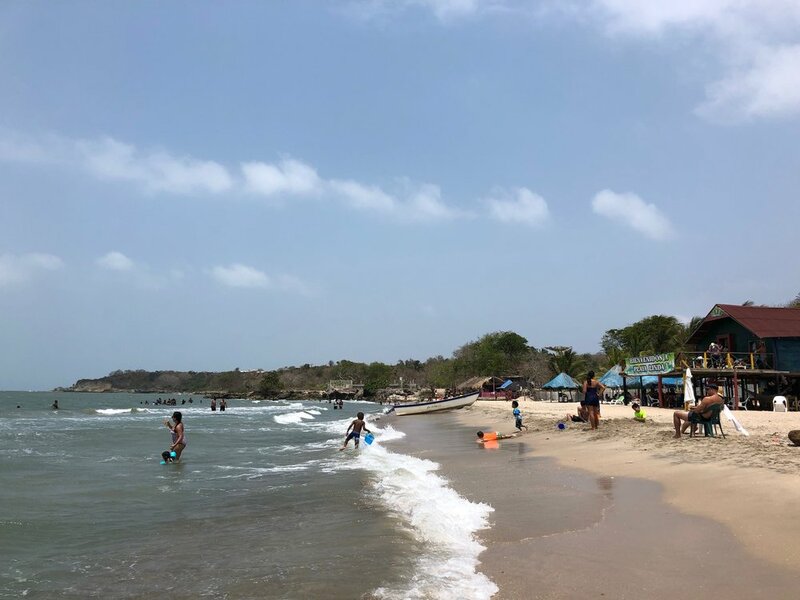 To visit, we loaded onto a speedboat (lancha) from the spot on the Castillogrande beach located behind the Bocagrande Hospital. Our friends have been employing the same boat captain for years. His name is William and he and his crew are exceptional. He even recently purchased a nice, new orange boat with a reliable engine. Plus, most importantly, he has proven himself in that he has always returned to pick up our friends from the beach at the end of the day. 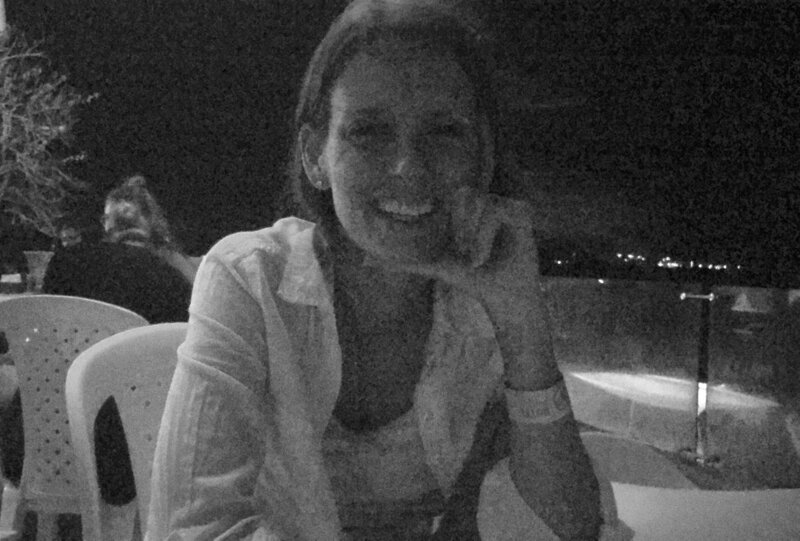 This is very important quality in a boat captain from Cartagena. To hire a boat captain, you pay him half at the beginning of the trip and the remainder when he returns to take you home. William charged $60mil Colombian pesos (approximately $21 American dollars) round trip. Even though we filled his boat to full capacity at approximately 24 people, his charge remained the same. It was not dependent on the number of people. The boat ride to Playa Linda took less than 20 minutes. The full extent of the accommodations at Playa Linda. The beach itself is pretty stark and simply consists of a two-story hostel with a few thatched-covered palapas. You can rent a palapa for the day for $50mil Colombian peso (approximately $18 American dollars). This includes a table and as many chairs as you need. If you would like lounge chairs, those are an additional price (we rented 2 lounges for $20mil). There are also a couple of white sheet covered lounge beds. You are also invited to purchase the typical fried fish meal by the owner of the entire establishment, Ishmael, that comes with rice and fried plantains. The fish is incredibly fresh, like just caught off the shore of the beach moments earlier type of fresh. This side of the island experiences more wind than the bay side which results in water that has good rolling waves that are perfect for boogie boarding. My kids spent hours riding the waves into shore. They also enjoyed catching sand crabs, spontaneously partaking in a sand throwing war with the other kids, and collecting sea glass and various shells. 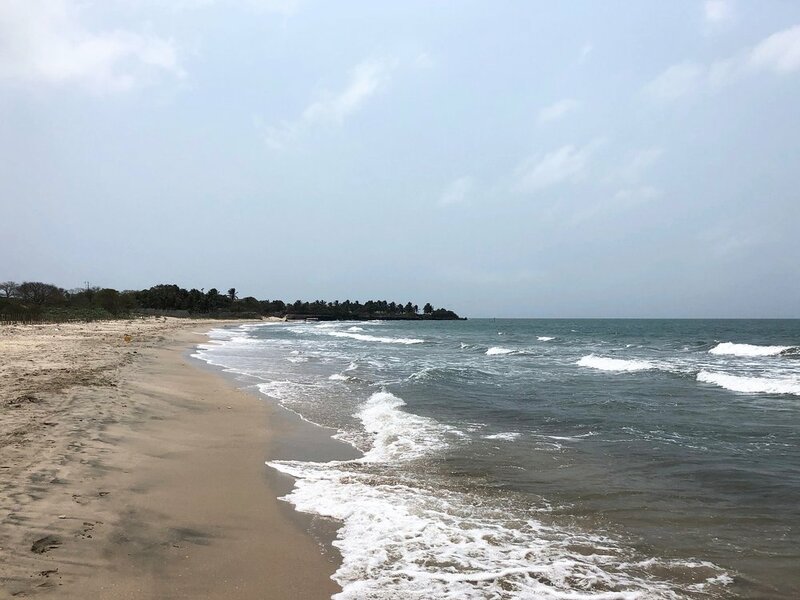 The sand on this beach is the dark grey sand typical for Cartagena. Looking north along the beach of Playa Linda. One great feature of this beach is that vendors are nearly non-existent. We were only approached by one lady offering massages the entire day. However, you need to be aware that your children, and more importantly their beach toys, will be the envy of the swarm of island kids who will join you at the beach. Just be prepared and prepare your kids before you arrive. If your children are willing to share their boogie board or sand toys with the local kids to use when your children are not using them, you'll see that it lights up their faces. If your kids are not keen on sharing, then simply tell the local kids no. They might be a bit persistent, but they were always polite. They will also tend to jump into playing with your kids if they start to toss balls, or partake in the sand fights mentioned earlier, etc. And, if you do chose to share, be sure to keep an eye on any items you allow the local kids to play with as the kids can tend to move down the beach and share the toys with their plethora of friends, but will quickly return them when asked. Facing south at Playa Linda. Overall, this is a very low-key place. It’s a great place to visit with a couple or boat load of friends for the day. We brought a cooler with drinks, snacks, and lunch. Plus, boogie boards, beach toys, sunglasses, hats, sunscreen, music, and towels. This place has limited accommodations, but is a nice reprieve from the busy, vendor-filled beaches typical of Cartagena. Location: Western shore of Isla Tierra Bomba, Cartagena, Colombia. Accessible only by boat. Cost: All transactions are done in cash. Approximately $110mil Colombian peso ($60 mil for the boat ride, $50mil for the palapa, table, and chairs), that's about $38 USD. Fried fish lunch and additional lounge chair rentals are extra. What to bring: Cooler with drinks, snacks, and lunch. Cash, sunglasses, hats, sunscreen, music, and towels. Boogie boards and beach toys that your kids may not mind sharing with the local children for the day. There are limited accommodations at this beach so plan to be self-sufficient. Apr 10 Should I Stay at an All-Inclusive?